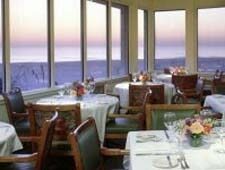 Walls of windows reveal a swath of the Gulf of Mexico in the resort’s outpost of contemporary continental cuisine. : With a something-for-everyone approach to suit hotel guests, the restaurants at The Colony Beach & Tennis Resort draw broadly from among urbane Longboat Key locals. The resort’s dining venues have staying power partly due to their sheer range of choices, and partly because so many local chefs cut their chops here; Parker Lee currently commands the top toque. Head to The Colony Dining Room if fancy continental cuisine is what you seek. Gaze at a striking swath of the Gulf of Mexico revealed through walls of windows while enjoying red snapper “Colony” with wild mushroom risotto and lump crab meat.